The question of whether bread is unhealthy for you is asked a lot, especially if you are trying to make better food choices and to lose weight. Too often, bread is demonized because it is rich in carbohydrates which are thought to lead to spikes in blood sugar levels. Regular bread also contains phytic acid, a known enzyme inhibitor. However, not all bread is bad. In fact, bread made with whole organic grains and with as few ingredients as possible (the grain, water, salt and yeast or sourdough) is a very nutritious food that will not lead to weight gain, insulin or leptin resistance, but will actually reduce appetite and provide you with a wealth of nutrients and fiber. If you find such bread loaves near you, you are lucky and can consume them regularly as part of a healthy, nutritious diet. If such loaves are not found in your vicinity, there are three very nutritious breads that you most probably will find in your local health food shop. These three types of breads are not just a healthier alternative to most breads but also have wonderful nutritional benefits. The more robust alternative certainly to white flour but also even to whole grain flour bread is sprouted grain bread. The process of making sprouted grain bread involves first the sprouting of the grains allowing the proteins and carbohydrates in the grain to be broken down, thereby reducing the amount of starch they contain and enhancing their nutritional content. Sprouted grains also contain less gluten, which is difficult for some people to digest. The process of making sprouted grain bread involves soaking the grain seeds and then allowing them to sprout, removing off phytic acid and other lectins. According to a study led by Devi CB from the Punjab Agricultural University, the sprouting of grains enhances the digestibility of nutrients. Remember that phytic acid is known to inhibit digestive enzymes. And because sprouting removes the phytic acid, nutrients such as iron, zinc, magnesium, and other nutrients found in whole grains are absorbed much more easily. 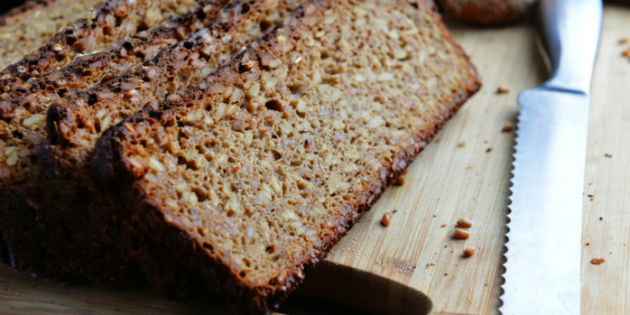 Sprouted bread can be found in wheat, rye and spelt varieties and is very moist and tasty, but it will only last about 3 sdays in refrigeration after being opened. Mestmacher loaves are made exclusively from organic, whole-grain rye. Their loaves of bread are baked with naturally grown ingredients that make them rich in fiber, wheat-free, vegan, and low-fat. The baking process involves extremely high temperatures that pasteurize the bread enabling it to stay fresh without the use of preservatives. In fact, Mestemacher loaves boast a shelf-life with products that remain fresh for one year after the date of production. This bread may take some time getting used to but will definitely give you the energy and nutrition your body is after. Matzo is an unleavened flatbread. Whole-grain versions of matzo contain only two ingredients (the organic whole grain and water), and are a rich source of fiber and B vitamins such as riboflavin, thiamin, niacin, and vitamin B-6. The whole-grain variety of matzo delivers major benefits. Matzo is a good source of carbohydrates and is fat free In fact, a 1/2 -ounce serving of whole-wheat matzo is only 49 calories. And because matzo is rich in manganese and selenium, you also enjoy the benefits of antioxidants which protect your cells from damage due to free radicals. Furthermore, the chewing required to consume wholegrain matzo is actually very beneficial for brain function and is known to increase levels of Brain Derived Neurotrophic factor (BDNF) a brain growth factor that supports brain cell health and even neurogenesis and is known to help reduce depression and other mental imbalances. Before you decide to ditch bread altogether from your diet because you fear the carbohydrates will lead to weight gain; know that certain breads are very good for your health and actually support weight loss! All of the above mentioned breads are ideal for diabetes, cholesterol conscious diets, sports enhancement and weight loss. Devi CB, Kushwaha A, Kumar A. Sprouting characteristics and associated changes in the nutritional composition of cowpea (Vigna unguiculata). 2015 Oct;52(10):6821-7. doi: 10.1007/s13197-015-1832-1. Epub 2015 Apr 14. Plagens-Rotman K, ?ak E, Pi?ta B. Odds ratio analysis in women with endometrial cancer. 2016 Mar;15(1):12-9. doi: 10.5114/pm.2016.58767.